↑ ୧.୦ ୧.୧ ୧.୨ ୧.୩ ୧.୪ ୧.୫ ୧.୬ ୧.୭ "Tuberculosis Fact sheet N°104". WHO. October 2015. Retrieved 11 February 2016. ↑ "Basic TB Facts". CDC. March 13, 2012. Retrieved 11 February 2016. ↑ Hawn, TR; Day, TA; Scriba, TJ; Hatherill, M; Hanekom, WA; Evans, TG; Churchyard, GJ; Kublin, JG; Bekker, LG; Self, SG (December 2014). "Tuberculosis vaccines and prevention of infection". Microbiology and molecular biology reviews: MMBR. 78 (4): 650–71. doi:10.1128/MMBR.00021-14. PMC 4248657. PMID 25428938. ↑ ୮.୦ ୮.୧ Organization, World Health (2008). Implementing the WHO Stop TB Strategy: a handbook for national TB control programmes. Geneva: World Health Organization. p. 179. ISBN 9789241546676. ↑ "Tuberculosis". World Health Organization. 2002. ↑ ୧୧.୦ ୧୧.୧ ୧୧.୨ ୧୧.୩ ୧୧.୪ ୧୧.୫ ୧୧.୬ ୧୧.୭ ୧୧.୮ ୧୧.୯ Lawn, SD; Zumla, AI (2 July 2011). "Tuberculosis". Lancet. 378 (9785): 57–72. doi:10.1016/S0140-6736(10)62173-3. PMID 21420161. ↑ Behera, D. (2010). Textbook of Pulmonary Medicine (2nd ed.). New Delhi: Jaypee Brothers Medical Publishers. p. 457. ISBN 978-81-8448-749-7. ↑ Halezeroğlu, S; Okur, E (March 2014). "Thoracic surgery for haemoptysis in the context of tuberculosis: what is the best management approach?". Journal of Thoracic Disease. 6 (3): 182–5. doi:10.3978/j.issn.2072-1439.2013.12.25. PMID 24624281. ↑ ୧୭.୦ ୧୭.୧ Golden MP, Vikram HR (2005). "Extrapulmonary tuberculosis: an overview". American Family Physician. 72 (9): 1761–8. PMID 16300038. ↑ ୨୩.୦ ୨୩.୧ Madison B (2001). "Application of stains in clinical microbiology". Biotechnic & Histochemistry. 76 (3): 119–25. doi:10.1080/714028138. PMID 11475314. ↑ Parish T., Stoker N. (1999). "Mycobacteria: bugs and bugbears (two steps forward and one step back)". Molecular Biotechnology. 13 (3): 191–200. doi:10.1385/MB:13:3:191. PMID 10934532. ↑ "Acid-Fast Stain Protocols". 21 August 2013. Retrieved 26 March 2016. ↑ van Lettow, Monique; Whalen, Christopher (2008). Nutrition and health in developing countries (2nd ed.). Totowa, N.J. (Richard D. Semba and Martin W. Bloem, eds. ): Humana Press. p. 291. ISBN 978-1-934115-24-4. ↑ van Soolingen D., et al. (1997). "A novel pathogenic taxon of the Mycobacterium tuberculosis complex, Canetti: characterization of an exceptional isolate from Africa". International Journal of Systematic Bacteriology. 47 (4): 1236–45. doi:10.1099/00207713-47-4-1236. PMID 9336935. ↑ Niemann S., et al. (2002). "Mycobacterium africanum Subtype II Is Associated with Two Distinct Genotypes and Is a Major Cause of Human Tuberculosis in Kampala, Uganda". Journal of Clinical Microbiology. 40 (9): 3398–405. doi:10.1128/JCM.40.9.3398-3405.2002. PMC 130701. PMID 12202584. ↑ Niobe-Eyangoh S.N., et al. (2003). 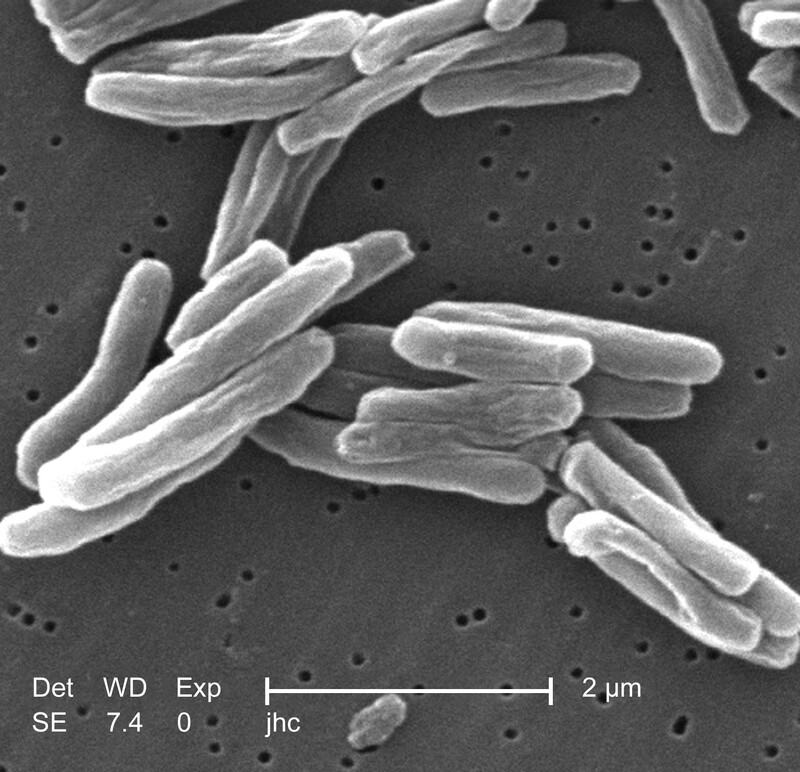 "Genetic Biodiversity of Mycobacterium tuberculosis Complex Strains from Patients with Pulmonary Tuberculosis in Cameroon". Journal of Clinical Microbiology. 41 (6): 2547–53. doi:10.1128/JCM.41.6.2547-2553.2003. PMC 156567. PMID 12791879. ↑ Pfyffer, GE; Auckenthaler, R; van Embden, JD; van Soolingen, D (Oct–Dec 1998). "Mycobacterium canettii, the smooth variant of M. tuberculosis, isolated from a Swiss patient exposed in Africa". Emerging Infectious Diseases. 4 (4): 631–4. doi:10.3201/eid0404.980414. PMC 2640258. PMID 9866740. ↑ Panteix, G; Gutierrez, MC; Boschiroli, ML; Rouviere, M; Plaidy, A; Pressac, D; Porcheret, H; Chyderiotis, G; Ponsada, M; Van Oortegem, K; Salloum, S; Cabuzel, S; Bañuls, AL; Van de Perre, P; Godreuil, S (August 2010). 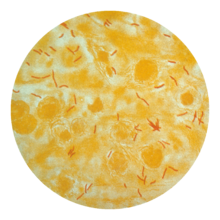 "Pulmonary tuberculosis due to Mycobacterium microti: a study of six recent cases in France". Journal of Medical Microbiology. 59 (Pt 8): 984–9. doi:10.1099/jmm.0.019372-0. PMID 20488936. ↑ ୩୬.୦ ୩୬.୧ World Health Organization (2011). "The sixteenth global report on tuberculosis" (PDF). ↑ Chaisson, RE; Martinson, NA (13 March 2008). "Tuberculosis in Africa—combating an HIV-driven crisis". The New England Journal of Medicine. 358 (11): 1089–92. doi:10.1056/NEJMp0800809. PMID 18337598. ↑ ୩୯.୦ ୩୯.୧ Griffith D, Kerr C (1996). "Tuberculosis: disease of the past, disease of the present". Journal of Perianesthesia Nursing. 11 (4): 240–5. doi:10.1016/S1089-9472(96)80023-2. PMID 8964016. ↑ ୪୦.୦ ୪୦.୧ ATS/CDC Statement Committee on Latent Tuberculosis Infection (June 2000). 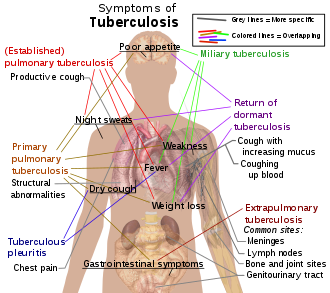 "Targeted tuberculin testing and treatment of latent tuberculosis infection. American Thoracic Society". MMWR. Recommendations and Reports. 49 (RR–6): 1–51. PMID 10881762. ↑ van Zyl Smit, RN; Pai, M; Yew, WW; Leung, CC; Zumla, A; Bateman, ED; Dheda, K (January 2010). "Global lung health: the colliding epidemics of tuberculosis, tobacco smoking, HIV and COPD". European Respiratory Journal. 35 (1): 27–33. doi:10.1183/09031936.00072909. PMID 20044459. These analyses indicate that smokers are almost twice as likely to be infected with TB and to progress to active disease (RR of about 1.5 for latent TB infection (LTBI) and RR of ∼2.0 for TB disease). Smokers are also twice as likely to die from TB (RR of about 2.0 for TB mortality), but data are difficult to interpret because of heterogeneity in the results across studies. ↑ Restrepo, BI (15 August 2007). "Convergence of the tuberculosis and diabetes epidemics: renewal of old acquaintances". Clinical Infectious Diseases. 45 (4): 436–8. doi:10.1086/519939. PMC 2900315. PMID 17638190. ↑ Möller, M; Hoal, EG (March 2010). "Current findings, challenges and novel approaches in human genetic susceptibility to tuberculosis". Tuberculosis. 90 (2): 71–83. doi:10.1016/j.tube.2010.02.002. PMID 20206579.